“Where you guys from?” the coffee-shop lady asked as sunnily as the San Diego day outside. “Bermuda,” I said, appreciating the subtropics wouldn’t elicit the same wide-eyed envy it does in, say, Toronto, or New York for that matter, in mid-April. What I wasn’t prepared for was utter oblivion. “You mean, like the Triangle?” she replied without a hint of irony. “Indeed, that is correct,” I replied, and waited for her follow-up that wasn’t forthcoming. “It is a real place, too,” I advised her, before resorting to showing her Bermuda location photos on my iPhone. It was the first of a half-dozen similar encounters that day alone—making Team Bermuda well aware it had its ambassadorial work cut out on the streets of southern California. Not so much when it came down to business at the actual conference. At the 10,000-delegate event hosted by the Risk & Insurance Management Society [RIMS], Bermuda was feted like the Homecoming Risk-Capital Queen. Yet this and other conversations around RIMS 2016 crystallised again the bubble we inhabit on our 21 square miles, and how much global public awareness we need to promote a more educated understanding of Bermuda. About the very fact we exist. As this US election year continues, we took the opportunity to spread our Bermuda message, specifically, about the innovative opportunities Bermuda offers—for visitors and business folk. At RIMS, Team Bermuda took on that challenge both at the conference and beyond, proving how vital it is for us to show a unified presence at this key annual event, both for concrete business-sector development and overall edification about the island. Some 200 people made the journey from Bermuda to RIMS this year—at a time when it’s never been more important for us to fly the flag. Our mission was both to accentuate the positive [Bermuda’s award of Solvency II status from Europe in March after a six-year campaign—a big deal in industry circles] and to mitigate the ill-informed negative [the Panama Papers broke just a week before the conference kicked off]. We wasted no time on either front. Over the first two days at RIMS, a team of government, regulatory and industry leaders conducted almost two-dozen interviews with leading insurance industry media, including Business Insurance, Insurance Day, Reactions, Insurance Insider and AM Best TV. Our panel included Premier Michael Dunkley, Finance Minister Bob Richards, Economic Development Minister Dr Grant Gibbons, Bermuda Monetary Authority CEO Jeremy Cox, Chairman Gerald Simons and Managing Director Craig Swan, as well as Paul Scope, Chair of Willis Towers Watson. And yours truly. Interviewers zeroed in on both hot topics—presenting us with a timely opportunity to promote Bermuda’s advantages as an elite domicile that fuels economic globalisation on the one hand, and as a very different [compliant, transparent, well-regulated] international financial centre on the other. We tweeted, we posted, we were liked, followed and re-grammed. Our Twitter account hit 1,000. Inside the conference, our industry partners, armed with fact-filled BDA talking points, sang from the same hymnbook, both at their own corporate exhibits and while volunteering at the ever-popular Bermuda Booth, where our much sought-after Bermuda bags were handed out to eager delegates. Speed-networking sessions were held here, bringing together prospective business with a team of Bermuda regulators, auditors, bankers and brokers. We were also joined by our partners from the Bermuda Tourism Authority, who provided synergy as we jointly talked up the island’s vacation-business offerings. On Day Two, our delegation, led by the Premier, received a rousing welcome from the global industry during a tour of the hall, meeting prominent figures such as RIMS President Julia Pemberton and CEO Mary Roth, who will visit the island in late September for the ALARYS Congress at the Hamilton Princess. Lloyd’s of London CEO Inga Beale personally greeted the Bermuda contingent, inviting us to join her Inclusion@Lloyd’s diversity campaign. Our Bermuda Reception provided the grand finale, attracting an invite-only executive crowd for an evening of networking. We were glad to have RIMS’ Pemberton and Roth join us—we will see them next at RIMS Canada in Calgary this fall. 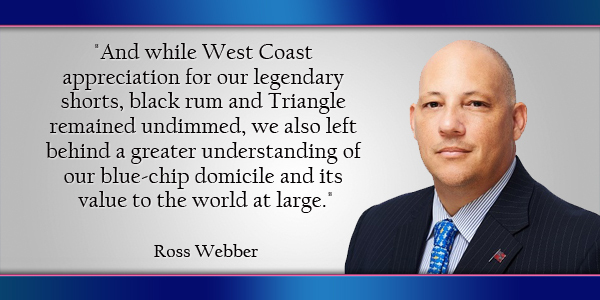 And while West Coast appreciation for our legendary shorts, black rum and Triangle remained undimmed, we also left behind a greater understanding of our blue-chip domicile and its value to the world at large.